The good news is that Smell-O-Vision is making a comeback. The bad news is that Smell-O-Vision is making a comeback. Those of us who lived our lives through movies in the Fifties and Sixties may soon be transported back to those hazy, crazy days when Hollywood used every goofy gimmick in the book to attract and hold onto audiences. Recently in New York, courtesy of Vapor Communications, a select audience was able to experience the return of Smell-O-Vision. Its reincarnation is called "digitized scent". And naturally -- there's an app for it. It's important to remember that movies were in a precarious position in the 1950s. Hollywood was terrified of television's incursion into the mediasphere. Box office revenues were declining. Producers were desperate. They were willing to try anything to put more bums into more seats. In the late Fifties, two odiferous movies made their debut. One was The Scent of Mystery, which used the patented Smell-O-Rama system. The device looks like large jukebox. It was put together by a strange Swiss inventor named Hans Laube. Various perfumes were fed through piping to a "smell brain" which then released the odours at the appropriate time into the theatre. Its advertising campaign was all about the history of innovative movie techniques. "First They Moved; Then They Talked; Now They Smell!" Unfortunately it didn't work. The odours were delivered to some parts of the moviehouse and not to others. You would have whole rows of sniffers vainly trying to smell something. It sounded like an arena full of cold sufferers. The other movie was Behind the Great Wall. It used a competing system called Aromarama which hardly worked at all. Producers tried various colour cameras, things like VistaVision, Todd AO, Cinemascope, 3D and Cinerama. 3D was meant to revolutionize movie watching for all time. It was supposed to put the audience in the middle of the action, surrounded by waves of stereophonic sound. It didn't work very well either. In the first place, it was used on some really terrible movies, such as Bwana Devil and Drums of Tahiti. Two prints had to be projected simultaneously, exactly. If one or the other was even a tiny bit out of sync, the film was unwatchable. Sometimes two projectionists were needed. Cinerama couldn't find an audience, despite the edgy camera work on Coney Island roller coasters. Once again, the idea was that audience members were right in the middle of the action. My favourite gimmick was The Tingler, from 1959. The estimable Vincent Price played a scientist who discovered that inside every human was a parasite, which he called the tingler. The tingler curled up in the human spine and unfolded if the person was terrified of something. The only cure was to scream. The Tingler was the brainchild of schlockmeister William Castle, who may have been the greatest Hollywood showman ever. Among his films, there was movie junk such as Let's Kill Uncle, Slaves of Babylon and Zotz. But he also produced Rosemary's Baby. For one of his films, each member of the audience was given a $1,000 Lloyd's of London insurance policy, should they die of fright. Vibrating joy buzzers were wired into some seats in the theatre so when a particularly scary part of the film came on, the viewer would get a tiny buzz. Castle dressed bit players as nurses to stand by, in case people fainted from fright. 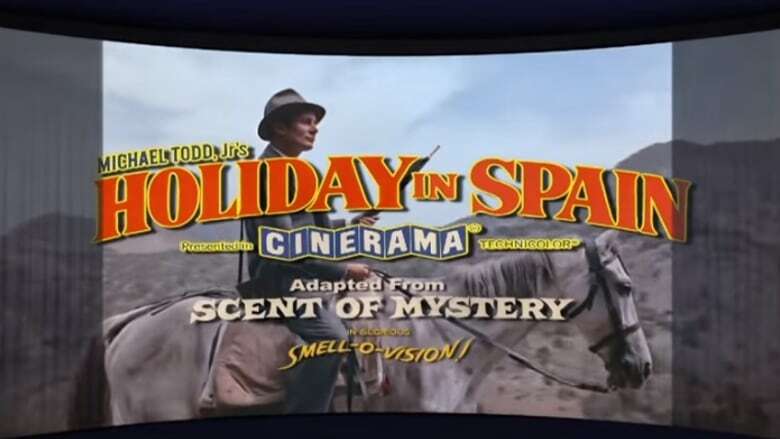 If current audiences lose their appetite for superhero sequels and remakes of old movies, the return of Smell-O-Vision might bring back the casual moviegoer. It makes … scents … to me. Click "listen" above to hear Michael's essay.